I layered Always Artichoke, Ruby Red, So Saffron, More Mustard and Vanilla. I color embossed the large Vanilla layer by rubbing the 'flat' side of the Finial Press embossing folder with So Saffron ink, the ran my piece of Vanilla cs through the Big Shot. If you don't make the sandwich too tight, you get a nice etching of color, giving it an old-fashioned, tin ceiling sort of feeling. 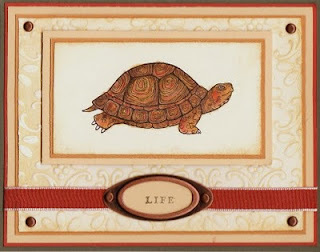 I love the contrast of the turtle image with the vintagey embossed background - very cool! So glad you played this week! Colors are great. I've got to get his set. I've admired it for some time and you have sealed the deal with this stunner. Whenever I see a card made with this set it's always very green. I love the colors you chose, and you did a fantastic job with the sketch! Great masculine card, it fits the sketch so well! Thanks for playing along this week! What a great card Lisa!!! Love the colors you went with, very nice!! Thanks for playing along with us this week over at Stamping 411! !